Two shadows slipped across the frozen landscape and away from a freshly killed elk. Their movements quick and light as they navigated a maze of sagebrush, the pair of wolves made their way toward me. The darker one led the other, a younger wolf in the pack, just as she had done during the hunt. As I watched, they moved closer, their warm breath momentarily visible in the cold air. Soon, I could hear their rhythmic footfalls on crunching snow. It was my third trip to Yellowstone National Park, my second as a natural sounds recordist, and my first in search of wolves. I’d come to document the sounds of these animals in January 2016, in order to preserve their voices for the park archives and for use in displays and stories for the public. If the pair I watched knew I was present, they gave no sign of it. Instead, they greeted a third individual off to my right with brief sniffing and posturing. Then, as the light faded and darkness slowly overtook the day, these three members of the Lamar Canyon wolf pack spent the next 20 minutes in what can best be described as play. Just as I have seen my own domestic dogs do countless times before, these three very wild dogs ran, jumped and wrestled with each other, tails wagging as they brought the day to a close. Though millennia of evolution separate our domestic dogs from these wild ones, I saw the evolutionary links between them in their evening play. I work as a natural sounds recordist for moments like these. My mission is to create an aural history of the sounds of our wild lands, in sad anticipation of the future loss of species and the changes to ecological communities caused by human impact on the planet. At best, these recordings help inspire support for the conservation of species and ecosystems. At worst, I create acoustic fossils of animals and landscapes that are gone too soon. I believe in the importance of my work, but sometimes I wish it wasn’t so damn necessary. 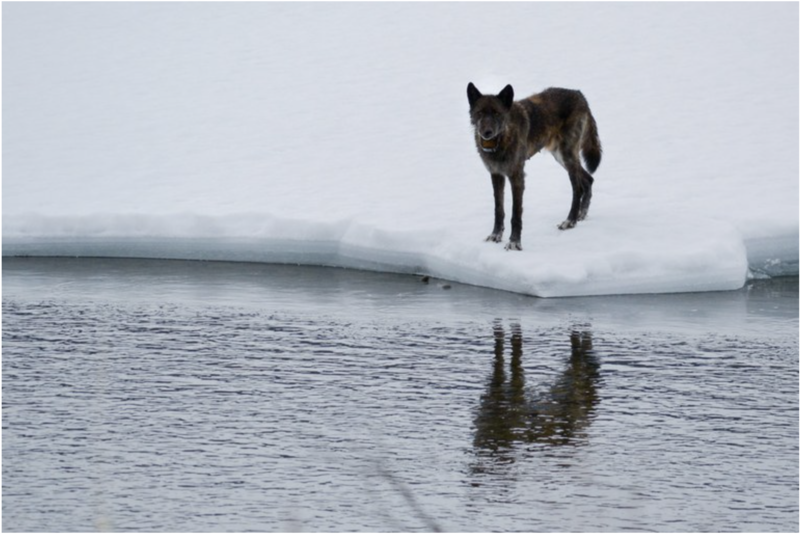 That January sighting was my very first glimpse of a wolf pack, and a remarkable one at that. The dark leader was the famous alpha female known to park biologists as 926F — affectionately named “Spitfire” by wolf watchers. In the two years since, this memory had faded, the details blurring, leaving me with just the unforgettable outlines. In November, 926F was legally killed by a hunter just outside park boundaries in Montana. When I first saw the story, it was just another headline noting the loss of another famous animal at the hands of a trophy hunter. Her even more famous mother had met the same fate six years prior. But then, a note of recognition rang, and my stomach slowly sank. I scrambled around, searching through old pictures and leafing through my field notes. It was her: my first wolf, and a prominent figure in my first field recording of a truly wild and iconic predator. She was gone and her voice silenced. I sat alone in disbelief in my basement office, everything still except the humming of the ventilation system. I’d listened to her howl hundreds of times from this same spot, fondly reliving our encounter. In my recordings, 926F’s voice is forever preserved. I wanted to be upset at the hunter and angry at the hunting laws that allowed her death, but I couldn’t move past grief. For comfort, I put her recording on repeat. As howls filled the room, I drifted back to that January day in the park where our paths first crossed, and I remembered the sounds of a group of wild creatures at play. Jacob Job is a natural sounds recordist working for the Sound and Light Ecology Team at Colorado State University. He has recorded wilderness soundscapes in national parks across the Western United States, as well as natural areas in the Caribbean and Central America. Listen to his recordings here.